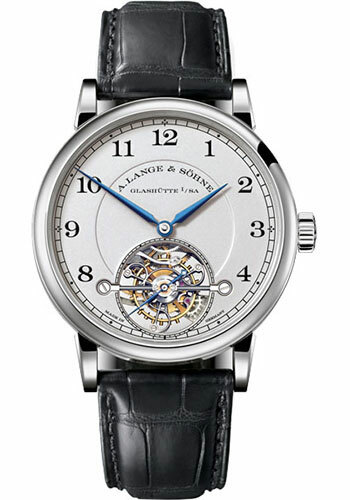 39.5mm platinum case, 11.1mm thick, transparent back, platinum bezel, scratch resistant sapphire crystal, silver dial with black printed arabic numeral hour markers, calibre l102.1 manual winding movement with hours, minutes and subsidiary seconds dial, one-minute tourbillon with patented stop-seconds and patented zero-reset mechanism, approximately 72 hours of power reserve, black alligator/crocodile leather strap, deployant clasp buckle. Water resistant to 30 m (100ft). 39.5mm 18K pink gold case, 11.1mm thick, transparent back, 18K pink gold bezel, scratch resistant sapphire crystal, silver dial with black printed arabic numeral hour markers, calibre l102.1 manual winding movement with hours, minutes and subsidiary seconds dial, one-minute tourbillon with patented stop-seconds and patented zero-reset mechanism, approximately 72 hours of power reserve, brown alligator/crocodile leather strap, deployant clasp buckle. Water resistant to 30 m (100ft).